Nicolas Anelka: Lord Ouseley accuses FA of "bad practice"
Kick It Out chairman Lord Ouseley has accused the Football Association of "bad practice" over the speed of its investigation into Nicolas Anelka's "quenelle" gesture. The West Brom striker made the sign, described as an inverted Nazi salute, on 28 December, with no update from the FA expected until 20 January. "They said it would take as long as it needs to take to come to a conclusion," Ouseley told BBC Radio 5 live. "We think that's really bad practice." 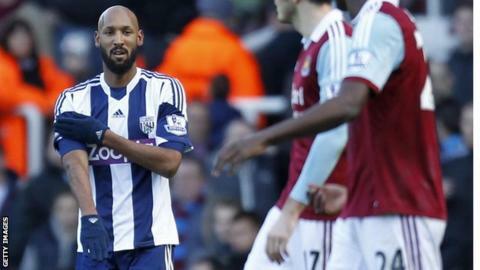 Frenchman Anelka has promised not to repeat the gesture, which he said was made in support of performer Dieudonne M'bala M'bala. The French government, whose Sports Minister Valerie Fourneyron described the gesture as "anti-semitic", has tried to ban the performer from making the sign at his shows. "Uefa have demonstrated they can sort a matter out within a week which they did with " added Ouseley. "The FA itself carried out an investigation within 24 hours when Roy Hodgson was alleged to have made comments regarding monkeys and spaceships and that killed that quite effectively. "And the Jewish community and the Jewish fans, who believe this has been an anti-Semitic insult and that it should have been resolved, see it as an open-and-shut case, and quite frankly I don't know why the FA has taken so long and is not informing people why it's taking so long." Yaya Toure was subject to racist chanting in a Champions League game against CSKA Moscow, while Hodgson was criticised for referring to a joke about a monkey and an astronaut at half-time in a World Cup qualifier against Poland. The FA has appointed an expert to help them look at the sign made by Anelka after scoring in the 3-3 draw with West Ham. Ouseley continued: "We appreciate thoroughness is a necessity but also time, and speed and swiftness, is also important. "Because these matters, when they drag on, it leads to all sorts of toxicity that gets into the system and the processes." Ouseley also revealed Kick It Out has faced criticism itself from those who wonder why the campaigning group has not been "slagging off the FA" and "saying Anelka is guilty".